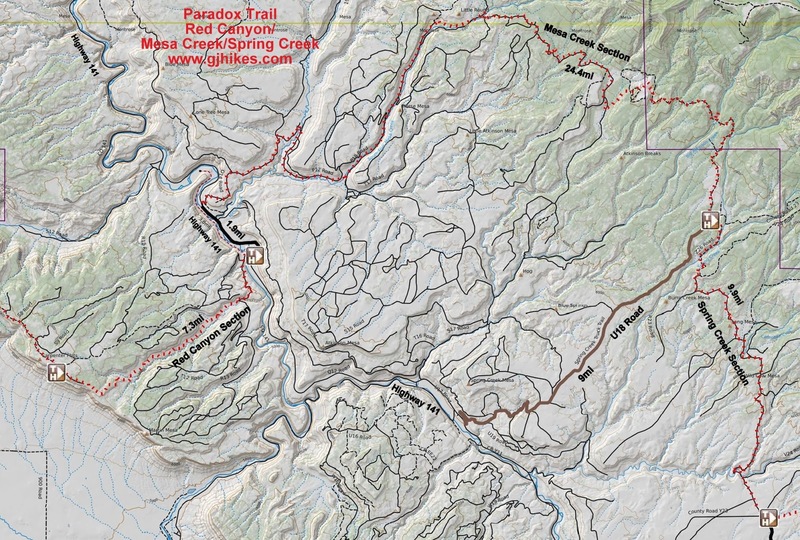 The Spring Creek Section of the 118 mile long Paradox trail begins where the Nucla Bypass Section reaches Z26 Road about 9 miles north of the town of Nucla, Colorado. 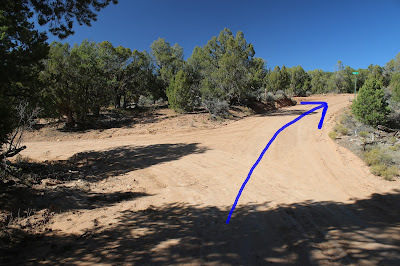 From there it follows Z26 Road for almost 10 miles to U18 Road which it follows for about a quarter mile before the Spring Creek Section ends and the next leg of the Paradox trail begins. The Spring Creek Section begins about 9 miles north of Nucla where the Paradox trail begins following the Z26 Road. 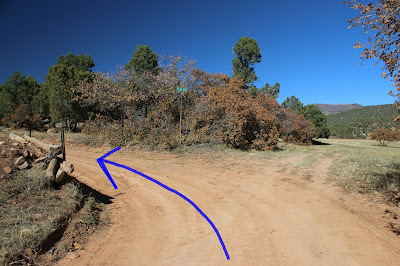 The trail follows the wide graveled road for a little over 1 mile before it drops into a small valley and crosses Tabeguache Creek where there are a few primitive campsites and usually at least some water in the creek. Unless you take the alternate route through Nucla this is the first water source that the Paradox trail comes to since leaving the Uncompahgre Plateau. After crossing the creek the trail begins its first big climb. The elevation profile shows that the Spring Creek Section of the Paradox trail has an elevation gain from one end to the other of 929 feet. The trail drops in and out of multiple drainages that result in totals of 1,917 feet of climbing and 989 feet of downhill. The first big uphill stretch is steep at first but becomes more moderate as it progresses and even has a few level to downhill parts. The next real downhill stretch around the 3.5 mile point gives up less than 100 feet of elevation. As the trail continues it begins passing through private property. The R23 Road branches off on the left around the 7.4 mile point. After passing the R23 Road the trail continues climbing over a hill and then begins descending toward Spring Creek. There is a gate as you come to the Spring Creek Ranch that you will want to be sure to close if that is the way that you found it. From the Spring Creek Ranch the trail climbs for a solid mile until it reaches the U18 Road. The route follows U18 road for about a quarter mile to where the Paradox trail branches off on the right and begins its next section. U18 Road leads 9 miles down to Highway 141 near the old townsite of Uravan and can be used as an access road in and out of the area. The Spring Creek Section is pretty in places and allows you to enjoy an area that few people even know is accessible. If you would like to see it for yourself then all you have to do is grab your bike or 'Take a hike'.